Antimicrobial, soothing and relaxing. 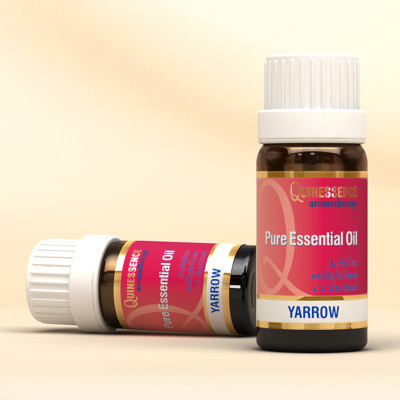 Yarrow Essential Oil is obtained from the flowers of Achilea millefolium, and there are numerous chemotypes of yarrow oil available to the aromatherapy market. The essential oil we supply is the chamazulene chemotype, and it has a sweet, herbaceous aroma with woody undertones. This essential oil is very dark blue in colour, making it very similar to German chamomile in both colour and aroma. From the same botanical family as chamomile (Asteraceae), Yarrow Essential Oil has many of the same therapeutic properties as German chamomile and has a powerful anti-inflammatory and antispasmodic action. This makes it ideal in massage blends to ease muscle cramps, stiff joints and digestive disorders, as well as soothing PMS and menopause related issues. In skin care, Yarrow Essential Oil delivers an astringent effect that helps reduce oiliness and tone dull, tired skin whilst also protecting from bacterial infection. This makes it valuable with acne, spots, burns and rashes since yarrow also helps to speed up the healing process. The powerfully relaxing effect of Yarrow is beneficial when treating stress related conditions or when trying to get a good night’s sleep. On an emotional level yarrow is said to help strengthen intuition and insight. Chamazulene, d-Cadinene, Sabinene, Myrcene, 1,8 Cineol, g-Terpinene, b-Pinene, a-Cadinol.